Increasing sales through health and wellness products is a hot topic in 2017. As today’s shoppers become more health conscious we need to adapt quickly and accordingly. Here are the top three trends to increase sales in 2017. 1. In-store events are an effective way to maintain loyalty and increase revenue. In an effort to help shoppers make healthier decisions, you will see more in-store dietitians and nutritionists joining grocery store teams. Making it a turn key experience for shoppers, they will also offer healthy recipes and food tips. 2. Healthy snacks and meals are becoming increasingly more popular. Consumers want lower sodium, less calories in a convenient, easy package. Snacks like veggies paired with dip will be a hot commodity. Natural and organic choices along with meals without preservatives, artificial flavors or hydrogenated oils are not losing steam in 2017. You can also count on products promoting gut health and immunity to be winners too. 3. Beverages with health benefits are rapidly gaining momentum. Expect to see more vegetable blends and beverages with probiotics. Beverages such as Kombucha tea that claim to stimulate the immune system, prevent cancer and aid digestion are also becoming popular. Spring is a great time to draw shoppers' attention to healthier food choices. 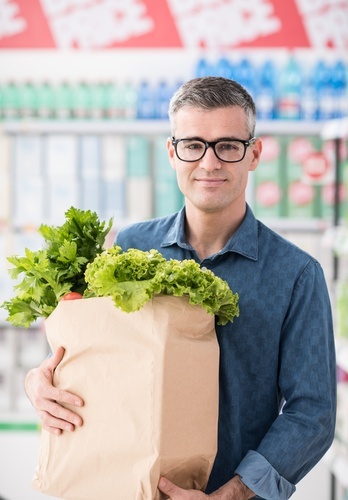 Considering more than half of shoppers make their purchasing decisions while browsing the shelves, it makes sense for retailers to guide them in making more healthful decsions.